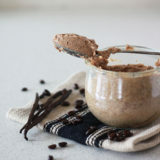 Homemade almond butter spruced up with espresso, vanilla, brown sugar, and kosher salt. Snack of champions! What’s better than homemade almond butter? I think caffeinated almond butter. 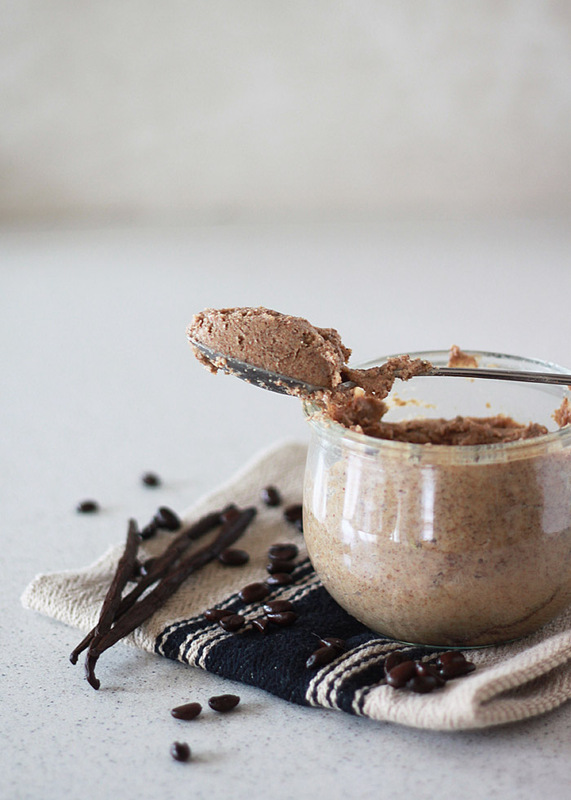 Vanilla Espresso Almond Butter. Coffee-spiked almond butter dotted with little specks of heady vanilla, sweetened with brown sugar, and perked up with a pinch of coarse salt. This is my kind of almond butter. I wish I’d thought of this dreamy combo all on my own, but, yeah. I didn’t. I was inspired by this incredible almond butter from Wild Friends. As soon as I set my taste buds on this stuff, I knew I had to make my own version at home. 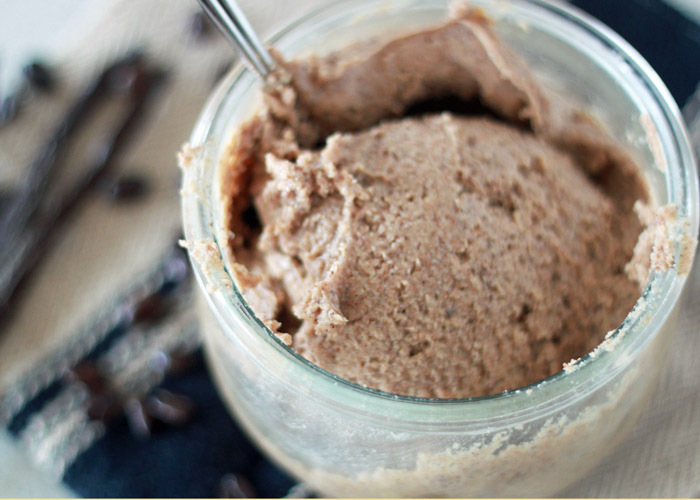 A couple of days ago, I showed you how to make homemade almond butter. All you need are almonds and a food processor or strong blender! So easy, right? Well, the plain homemade stuff is plenty incredible. But when you stir in stuff like espresso, vanilla, and brown sugar … nirvana, my friends. I like to spread this on toast or just eat it by the spoonful for a quick energy-boosting snack. Caffeine and almond butter. Nature’s perfect duo. Place almond butter to a medium bowl and add remaining ingredients. Stir well. Taste and add additional salt if desired. Keeps refrigerated in an airtight container for up to 2 weeks. For instant espresso granules, I buy Medaglia D'oro brand. Partially because it's usually the only kind I can find at local grocery stores, but I also just really like it. I am not a fan of the flavour of coffee myself but that is what I love about making your own nut butters; you can flavour them however you like! I do love the vanilla in this! It is seriously good with just the vanilla. I LOVE coffee everything, except coffee ice cream. I find it vile. So weird, right?! Oh my, pass me a spoon, and come to mama! This looks out of this world! Oooh, I remember that! It looked in-sane. In a good way. I still need to try that! This definitely sounds spoon worthy!! I think I could eat the whole batch in one sitting. Love all of the flavor combinations going on here! I may or may not have made myself slightly sick on this stuff. To me, it is actually a little reminiscent of cookie dough. So hard to stop! Dear Lord, I need a jar of this and a spoon stat! 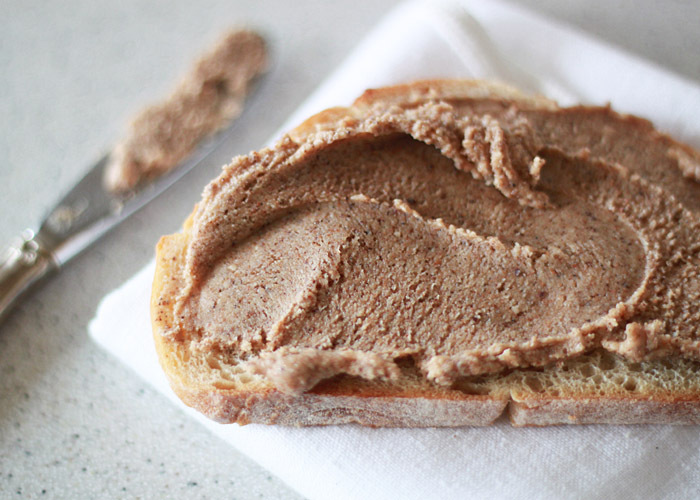 Nut butters are just one of those things where you can dress it up anyway! 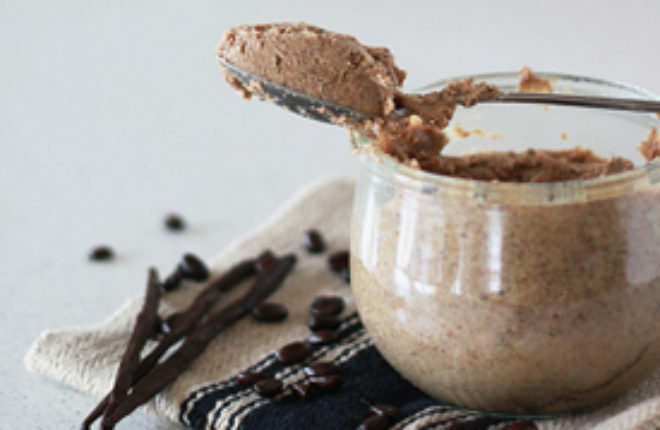 I love the idea of having vanilla almond butter! This looks amazing! I have been looking for an original almond butter recipe for a long time and this is even better! Thanks for sharing.